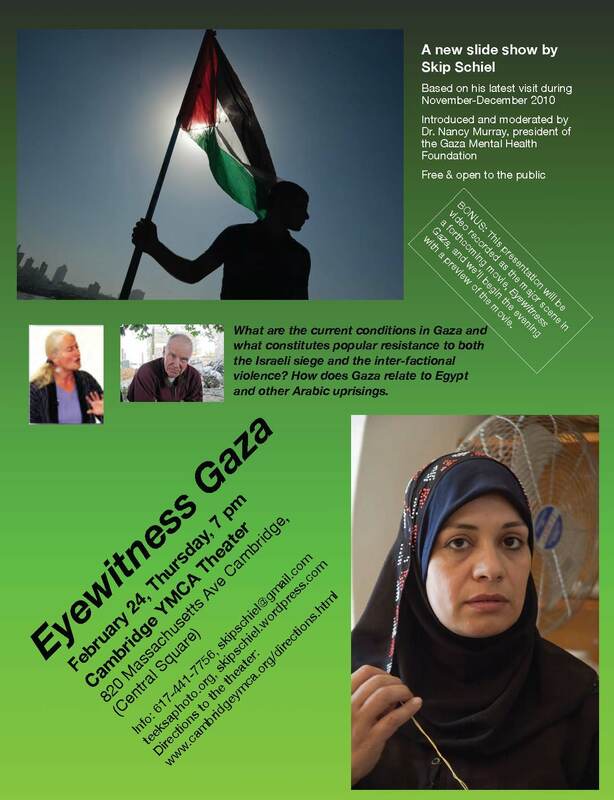 BONUS: This presentation will be video recorded as the major scene in a forthcoming movie, Eyewitness Gaza, and we’ll begin the evening with a preview of the movie being made by Tom Jackson of Joe Public Films in cooperation with Adham Khalil in Gaza. What are the current conditions in Gaza and what constitutes popular resistance to both the Israeli siege and the inter-factional violence? How does Gaza relate to Egypt and other Arabic uprisings. With the support of many in his local and national Quaker community, since 2003 Skip Schiel has been traveling to Israel and Palestine to investigate and portray conditions and struggles. He has worked with a variety of organizations, both Israeli and Palestinian and joint organizations, volunteering to make photographs for them that he also can circulate as slide shows and print exhibitions. His hope is to open eyes and doors and windows, encouraging awareness and action. A participatory photographer, photographing while engaging in struggles for justice, peace, right treatment of the environment, and enlightenment, Skip Schiel makes photos for publications, exhibits, slide shows, and individual use. His main current project is a photographic examination of conditions in Palestine & Israel. Other projects include retracing the Transatlantic African slave trade journey (A Spirit People), the earth (Scent of Earth), prisons (Imprisoned Massachusetts), and a Buddhist-led pilgrimage from Auschwitz to Hiroshima (Passing Through). He’s also photographed environmental desecration, racism and racial justice, South Africa, poverty, American Indians, the US South, and resistance to oppressive regimes in the US and abroad. He is exploring digital technology, curious about its influence on photography—producing, consuming, and thinking about the photograph. Since 1990 he teaches at the Cambridge Center of Adult Education, ranging from basic photography to digital darkroom and photographic field workshops concentrating on light in photography. He’s also taught photography at the Landscape Institute formerly at Harvard, the Quaker Palestine Youth Program in Palestine, filmmaking for 10 years at Boston College, and various workshops at Quaker gatherings. He joins with others in various campaigns for peace, justice, reconciliation, & truth-telling. He plays, experiments, & contemplates—might get arrested and imprisoned periodically. Maybe he joins a pilgrimage, a vigil, a rally or a talk or an outing along a river; maybe he simply stays home and absorbs the afternoon light. He photographs: he is a socially engaged photographer. He makes photographs for you a viewer, for his family and friends that you and they might know him more intimately, for himself to remember where and when he existed, and for you not yet born. He invites you to examine what he’s made & see what you think.